We had a quick business meeting this month called to order by Aviva. The meeting was limited to introducing ourselves to Royce, a newcomer, and doing show & tell. Kelly was present, spinning wool. 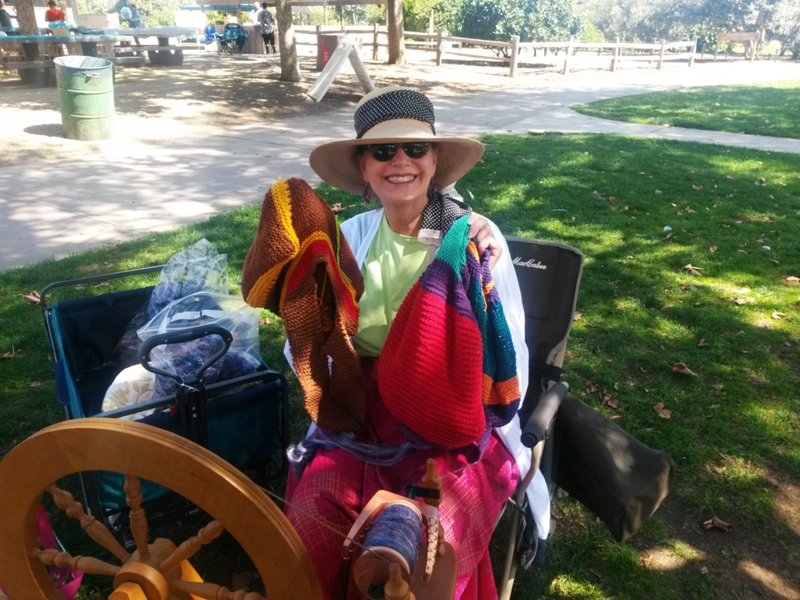 Laura was spinning on her big support spindle. 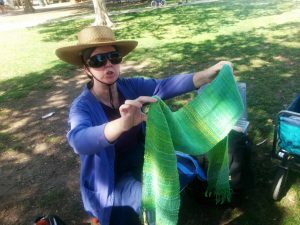 She showed us a green scarf that she’d woven on a borrowed Cricket loom. It was woven from a variety of yarns made from silk and/or cotton. Aviva was knitting a shawl from mohair that she bought at last year’s Lambtown festival. Royce, a newcomer to our group, showed up after learning about us on our website and contacting Aviva to confirm where & when. Royce has been spinning for a few months now. 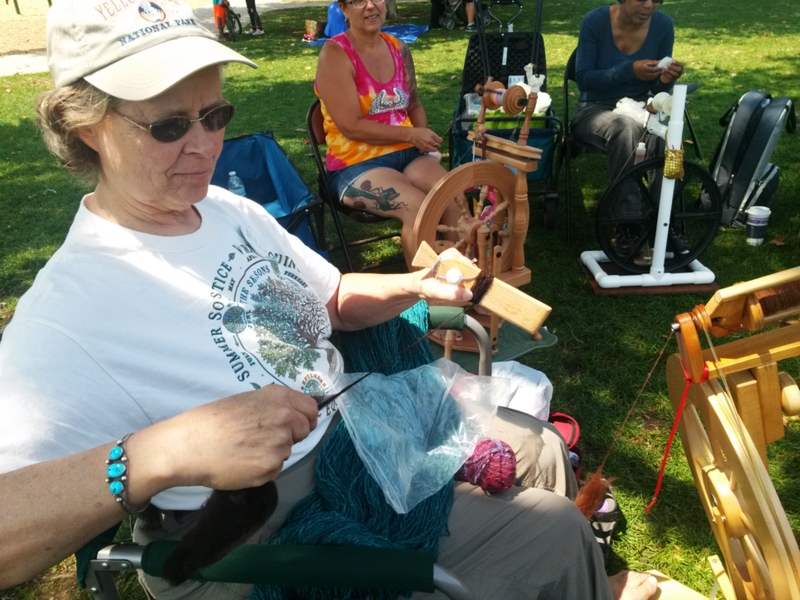 She was spinning a merino/tussah silk blend on an Ashford wheel during the meeting. This was her first experience with silk. She started drafting the blend as usual but wasn’t happy with the result. She then learned about spinning from the fold and after finding that technique gave the effect she wanted, has been using it ever since. 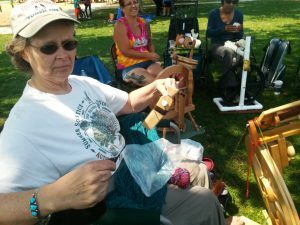 Royce is an experienced knitter. She’s been honing her spinning skills by studying sources such as Craftsy’s Foundations of Spinning. Royce showed us bags (many of them!) that she’d made. Cookie has been spinning Cormo and California Red of late. Most recently, she’s been spinning a blend of those two wool breeds. 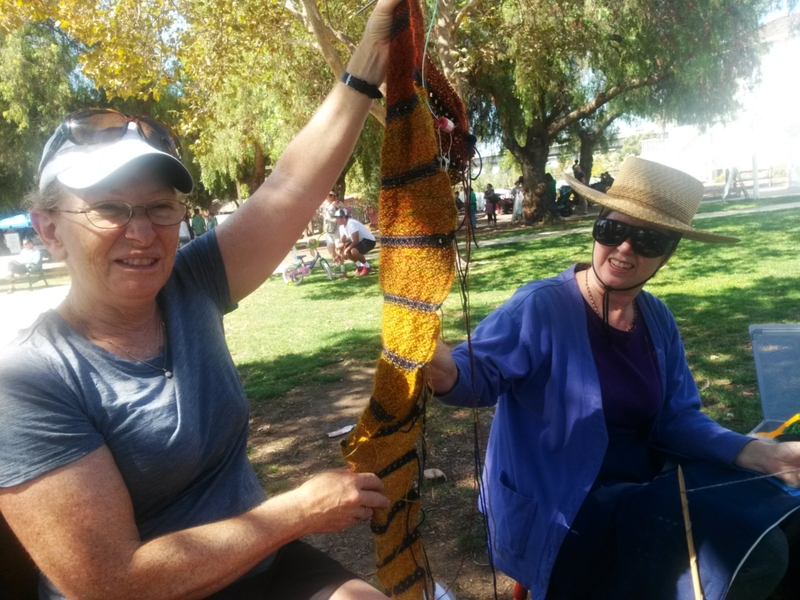 She also showed us one ball that she’d spun from the longer wool separated out by combing California Red. That ball was close to white. And Cookie showed us a second ball spun from the leftover shorter fibers. The second ball was distinctly reddish. If it were a horse, I’d call it a roan. 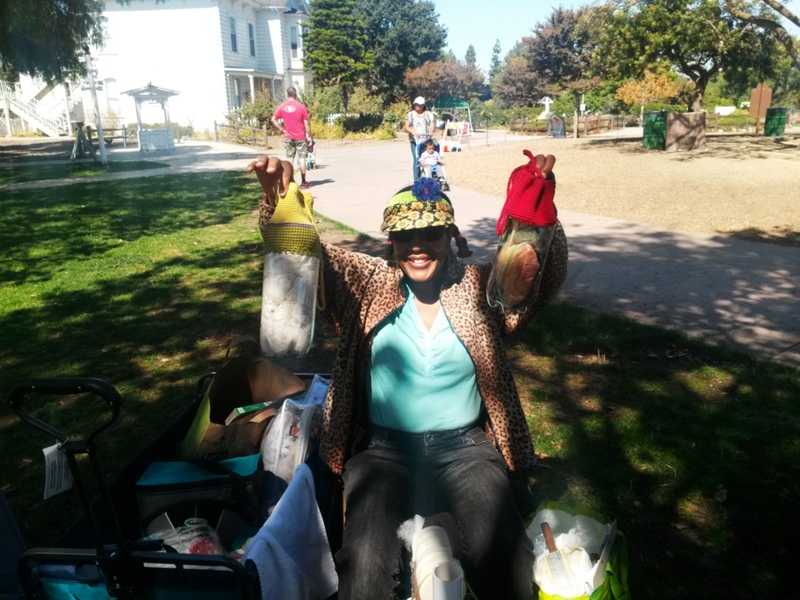 Cookie brought a couple of containers she’d made using crochet and empty 2 liter plastic bottles. Cookie cut off the top of the plastic bottles and put little holes near their cut edges. She then crocheted a cylindrical section anchored in the holes. She crocheted the top of the cylinder so as to let her thread a drawstring through and added a handle. The handles were made using a crochet hook as a lucet. In one container, Cookie is keeping silk caps and a drop spindle made from a dowel and a 1 inch wooden toy wheel. Ginger was still spinning her coarse gray Cotswold fleece. She would hand card a bit then spin it. She’s planning to weave that and some other coarse gray fleeces she has into fabric. She’s dreaming of sewing lined garments from the fabric — suits? coat? cape? Sharon, the events coordinator at the park, dropped by and asked if any of us could come October 1 to the park’s Mountain Music Fest to demonstrate (details at http://PruschFarmPark.og). Ginger promised to send out an email to the guild with Sharon’s contact info. 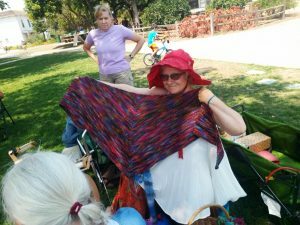 Unfortunately, some of us are already committed to the sheep to shawl contest Oct 1 at Lambtown. Lambtown also runs on Sunday so if any of you are in a position to demonstrate, please read your email and contact Sharon. This entry was posted in Uncategorized on September 18, 2016 by Aviva Garrett. We met under the trees on yet another beautiful, sunny summer day. As of July 31, we had $498.96 in our treasury. The cost of our web hosting has risen from $10.02 a month to $15.06 a month. That adds up to about $180 a year. We have enough in our treasury at this time to cope with the marked increase in our web hosting costs. Carol Lewis finished plying the warp for our team for October’s sheep-to-shawl content at Lambtown. She handed the warp off to our weaver during the week before our August meeting. So we’re on track for the event. Carol Lewis relayed the recruiting call put out by Lynn Curry and Sue Duffield for volunteers to help them staff their spinning demo at the Highland Games (Labor Day weekend at the Alameda County Fairgrounds in Pleasanton). FYI: Margaret will be performing in the Harper’s Hall next door to the spinners. The domain name for the World Wide Spinning Day has lapsed so it seems safe to assume that this is a defunct event. We’re not planning to do anything for it. FYI — if you like to dance, there is (or was over the summer?) a Barn Dance every other Wednesday at Emma Prusch Farm Park. 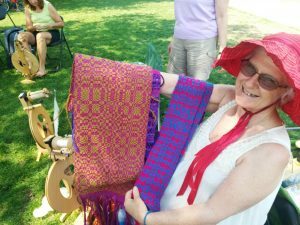 The rumors that Hannalore’s Custom Handweavers (in Mountain View) is going out of business right now are incorrect. Hannalore has just been recovering from hip surgery. Ange was present at our meeting, spinning away, but brought no show & tell. Cookie started the meeting spinning a white, fairly course fiber that like the wool some of the handspinner flocks featuring crosses such as Cotswold x Corriedale x Polypay. 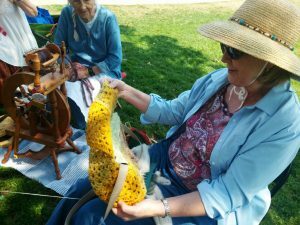 Later on, she switched to spinning silk on her handmade drop spindle with the polyclay whorl depicting a face. Cookie showed us a photo on her phone of a Motherbear project. If you’re on Facebook, you can also see it there. Cookie passed around some of the small balls of yarn she’d spun on her small 3-D printed Turkish spindles. Those are brightly colored drop spindles that break down into 3 pieces — two cross pieces and the spindle. Once you’ve finished spinning a spindle full, you pull out the cross pieces and slide a ready to use ball off the spindle. Kelly went to the fiber estate sale in Layfayette. She had also had fun on a trip to Sturgis. Kelly rode behind her husband on his motorcycle. They had the practical sense to stop at hotels instead of camping out overnights. 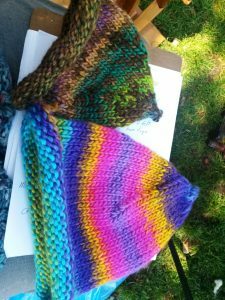 Kelly got her husband to stop at (yarn/fiber) stores enroute. Before they got back, Kelly had acquired enough yarn that she shipped a box home. Lotus finished the knitting baby dress that she’d just started at last month’s meeting. With the tiny bit of leftover yarn from the baby outfits, she made a tiny stuffed bear. Lotus spent much of the meeting spinning on her Inca spinner (a distinctly different take on a spindle compared to a drop spindle). The spinner she used was made by her husband. Lotus has plyed on her Inca spinner. First, she pairs up the strands from two spinner fully by taking a strand from each and winding the two unplyed strands onto a ball. Then she plys from the ball by spinning her Inca spinner in the reverse direction. Lotus has been spinning fiber from Bar-B-Woolies. That wool is from a business run by a long ago Serendipity member so it has been well aged in Lotus’s stash. She now has two bobbins totalling 416 yards. Ginger was spinning carded Cotswold wool at the meeting. She spent a lot of her time over the past month at non-spinning activities, e.g. reading her Kindle and knitting a beaded shawl. Patti showed off a lovely purse that she’d made out of her crocheted squares. 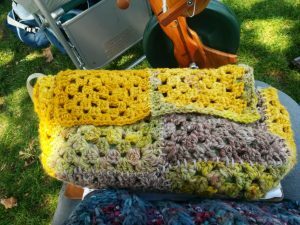 She had joined her squares, sewed fabric into a liner for the purse, and put it all together with a very nice handle/closure. Patti is now busy with her work as a teacher. School has started! Nancy got a “Knit Kit in a Box”. This kits makes balls for dogs. Each ball is knitted then felted. Nancy plans to give the balls she mad for her kids’ dogs. 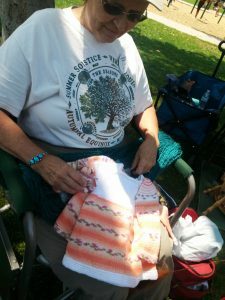 Nancy finished knitting the socks she was working on at last month’s meeting. Nancy and her husband spent a week this past month doing US Forestry park service volunteer work near Lake View, Oregon as part of their vacation. The rest of their vacation was spent in Santa Cruz. Nancy and her husband’s volunteer work started at the site of a wooden box mill dating back to about 1926 – 1936. The boxes were used to ship peaches and other produce. Their assignment was to look for artifacts. If the site was rich enough in artifacts, it would be considered for listing as a historical site. After hard work digging and sifting, Nancy and her husband got to tour a Morgan Butte Mountain fire lookout. The lookout stands on it searching for fires, even — or especially — during violent lightning storms. Nancy was particularly fascinated by a stool in the lookout whose feet were enclosed in the glass/ceramic thingees that you more usually see as insulators on high voltage electrical lines. The lookout stands on the stool when lightning is about, to reduce the odds of electrocution. The lookout tower has a lightning rod and grounding wire. Margaret was knitting “knockers” as gifts. Knockers are lightly stuffed and worn inside bras to add size or balance out the bust line. Margaret took her little wheel to Tahoe on vacation. She found a book at Barnes & Noble that she found was a great source of quick-knit patterns suitable for knitting on vacation or idle times. The book was called “Last Minute Knitted Gift”. Margaret knitted pointed hats from the book’s patterns. 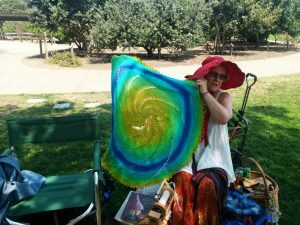 Margaret also knitted a spiral shawl and a couple of not-yet-blocked beaded scarves. Margaret was a very productive woman this past month as she also came with a set of 3 samplers of multi-shuttle (overshot) weaving and a new triangular shawl knitted from her favorite shawl pattern. Carol has been travelling a lot and spinning a lot. Over the past month, she plyed all of the warp for our sheep to shawl team that will compete at Lambtown. She then started spinning white wool from the box labelled “2004” that has been sitting in her garage for some time. This entry was posted in Uncategorized on September 11, 2016 by Aviva Garrett.